Bike boxes don’t fit in Maud very well, not even with the roof off. I tried one in there, realised I couldn’t see anything to the left or use the handbrake and decided not to chance my luck. There are students living near the allotment site, and honestly, they are like lemmings. Lemmings with ipods. However the boxes fit really easily into Mum’s tank, and unfathomably she lets me borrow it for this kind of thing. Looking at the list from last time I’ve not done too badly. I wanted to plant more things outside to make room in the greenhouse, but there are 50mph winds forecast tomorrow and Wednesday and that didn’t really seem sporting. I’ll do it on election day – it’ll keep me away from swing-o-meters and endless predictions before any results come in. Ahead of the windy spell my 3ft broad beans have been braced with canes and twine. I hope it does the trick. After all these months of growing I’d hate to see them flattened. 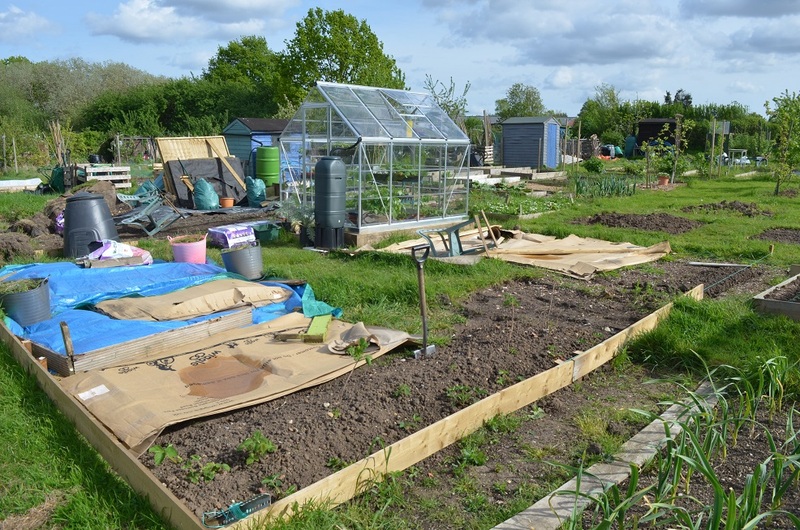 The compost bin is in situ and the mahoosive bike boxes have been laid out. Also hope they stay put. I don’t want to rescue them from half-way across the field. Speaking of which I’ve been reinforcing the greenhouse base so that won’t move either. I didn’t decouple the auto-vent or fix the wonky plastic panel and now I am wondering whether I should have…or possibly I may be worrying a bit too much. 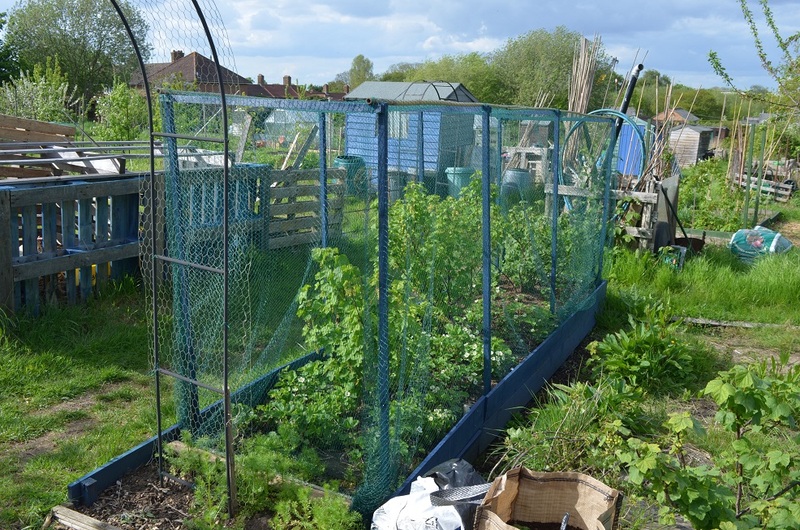 I have purple dahlia stakes around the gooseberries and the net cage is built on the redcurrant bed. Looks really pretty damned good and there will be no more faffing about with hoops that aren’t tall enough. Neither will be up permanently – unless of course I need them somewhere else. Putting them away for winter in the shed will keep the stakes from rotting a bit longer. I’ve dotted my cornflowers about in the beds and I hope the slugs don’t find them all. I have 6 left so if I can’t palm them off on Mum I’ll pop them round the rapidly drying pond. My plot neighbours gave me a lovely present for my spare strawbs and blackcurrants – a bottle of homemade slivovitz. It’ll make potting up the sweetcorn and popcorn very pleasant.